Most people seem to be lamenting the unofficial end of summer today. While I’ll miss the longer days and nice grilling weather, I’m more than okay with fall being here – because that means the start of football season. My beloved Giants will be kicking things off Wednesday night and I’m more than a little excited to hunker down on the couch with some football munchies and a beer to watch the game. 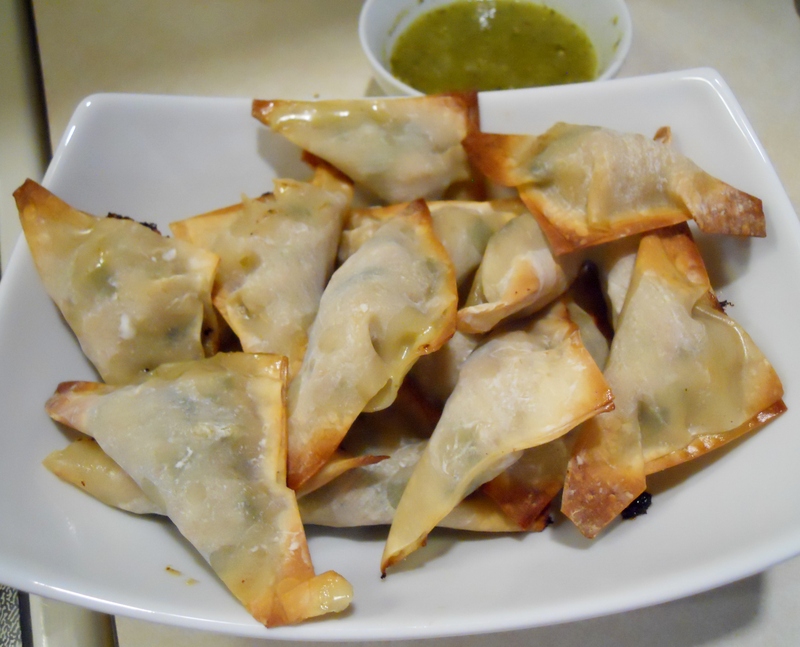 Since they’re baked instead of deep-fried, they’re healthier than traditional wontons so you won’t feel bad chowing down during the game – a perfect munchie option! What are your favorite game day eats? In a large frying pan, brown the ground chicken. When no longer pink, add in the onions and peppers and cook for 5 minutes, until vegetables are tender. Stir in garlic and cook until fragrant, about 30 seconds. Remove from heat. Transfer chicken mixture to a bowl. Stir in cilantro, salsa verde and ranch dressing. Add 1 heaping teaspoon of the chicken mixture to the center of a wonton wrapper. Wet the edges of the wrapper with water and fold over to make a triangle. Pinch sides together to seal. Place the finished wonton on a lined baking sheet. Repeat until all of the chicken mixture is used up. Bake for 15 minutes, until crunchy and golden brown around the edges. Serve with additional salsa verde for dipping.